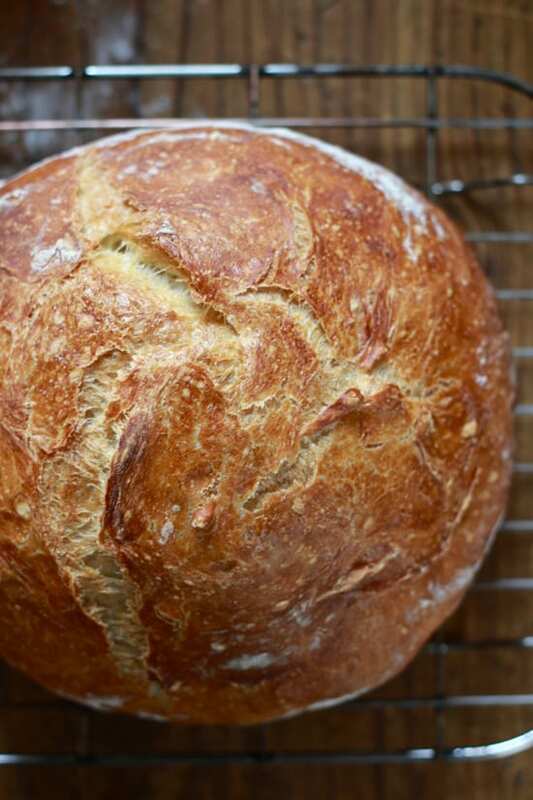 If you’re interested in baking your own bread, this is a great recipe for beginners. It’s Jim Lahey’s No-Knead Bread, which follows an incredibly easy formula: Simply mix up the dough and let it rest overnight. You don’t need a stand mixer, or a bread machine, and there’s no kneading involved! Just 2 minutes of prep time are required. The bread is baked in a dutch oven and the result is absolutely to die for; golden, crusty bread with a soft & chewy interior. First things first: Clear away all kitchen clutter and find yourself a nice workspace. This includes all bills, kids’ toys, and random phone chargers. Then, in a large bowl, add the dry ingredients and mix with water to combine. As it becomes difficult to stir, get in there with your hands and mush everything together. 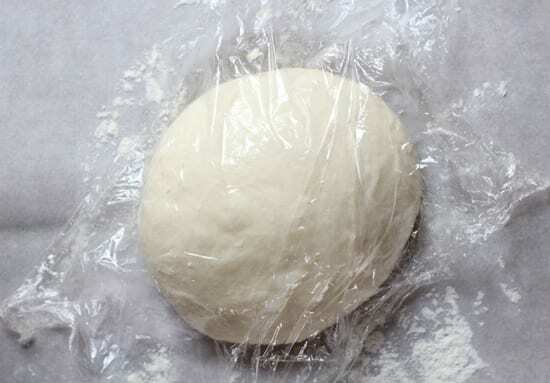 Transfer your dough to a lightly oiled container and cover loosely with oiled plastic wrap. Let the dough rest at room temperature (about 70 degrees F) for 14 hours- overnight. Your dough is ready when it has puffed up in volume, about 1 1/2- 2 x the original size. *Note: if your dough isn’t puffed and bubbly after the initial rise, place it in the microwave with the light on (keeping the door ajar). The warmth from the light will give the yeast a boost. My friend Celia gave me this tip and it works like a charm, especially in chilly kitchens! Flour a sheet of parchment paper. Remove the dough from its container and place it on top. Fold it in half (like a book) and then fold it in half again. Sorry, no photo for this one- my hands were too sticky! When you are finished folding, add more flour to the parchment paper (be generous so that it doesn’t stick). 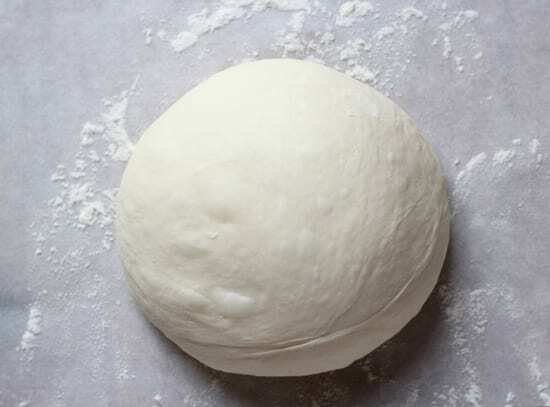 Shape the dough into a ball by gently tucking the sides underneath itself. And let it rest again until puffy. It will start to spread out slightly as it rises- this is ok. The 2nd rise will not take as long as the first, but expect to wait about 30 minutes- 2 hours depending how warm your kitchen is. If you’re impatient like me, now is a good time to use that microwave tip I mentioned earlier! About 1/2 hour before your dough is ready, preheat your oven to 500 F.
Place a dutch oven (with lid) inside for 20 minutes to heat up. *Tip: don’t have a dutch oven? See recipe below for additional bakeware options. When the pot is nice and hot, carefully slide your hand underneath the parchment paper and invert the dough into the baking vessel. 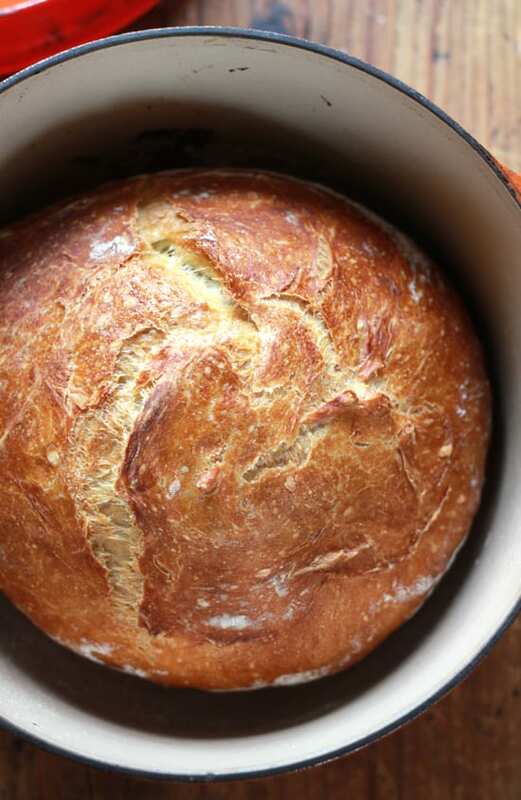 Place your bread into the oven, and immediately reduce the temperature from 500 to 400 F.
Bake with the lid on for 40 minutes (this will trap the steam inside making the bread moist). Then, remove the lid, and bake for an additional 15-20 minutes or until the crust is a deep, golden brown. *Note: To be sure that your bread is fully cooked, I highly recommend taking its temperature. Flip the bread on its side, and insert a thermometer into the bottom. It should read between 200-205 F. If not, leave it in a little longer (extra time in bread baking is a good thing). If you’re worried that the top will get too brown, put the lid back on. Better safe than sorry! When your bread is done, remove it from the oven and transfer to a wire rack. It should feel light and sound hollow when you knock on the bottom. You’ll also notice a wonderful crackling sound as it cools. Let it rest for at least 1 hour. And there you have it- fabulous, no-knead artisan bread! See? For all you beginners out there, when I first started, I had absolutely no clue how to bake bread. 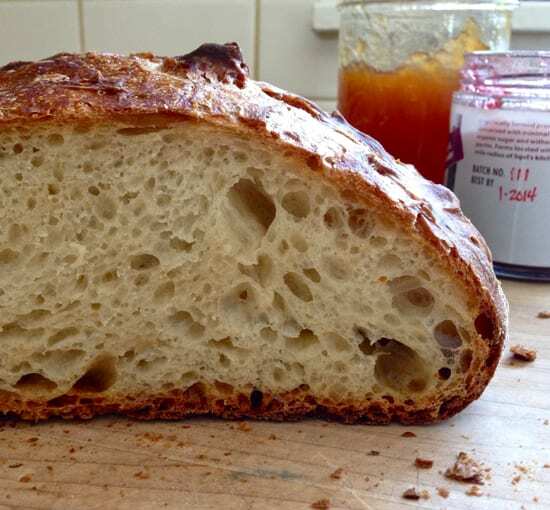 With practice, I’ve found that the ‘no-knead’ approach is a great starting point for anyone. It will give you the confidence to take on more challenging recipes as you continue to develop your skills and intuition. To me, baking bread at home is truly a rewarding experience. And this loaf cost less than $1 to make! Note: I used King Arthur bread flour & SAF instant yeast. 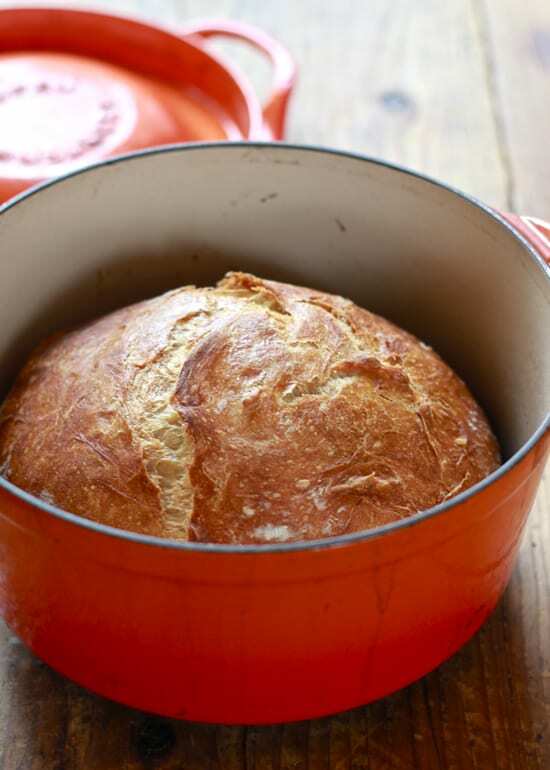 You can use any 6 quart dutch oven, cast iron, enamel, Pyrex or ceramic bakeware (with lid) that can heat up to 500 degrees F.
In a large bowl add the flour, yeast, salt and water. Stir until a rough dough forms. Transfer to an oiled container and cover loosely with plastic wrap. Let rise for 14 hours- overnight, at room temperature (about 70 degrees). Your dough is ready when it has puffed up in volume, about 1 1/2 -2x its original size. *See note below. Lightly flour a sheet of parchment paper and place the dough on top. Fold dough in half and then fold it in half again. Shape the dough into a ball by tucking the sides underneath itself, and place onto the paper, seam side down. Cover and rest again until puffy but not fully risen, about 30 minutes- 2 hours depending on how warm your kitchen is. Preheat your oven to 500 F. Put a (6 quart) dutch oven pot inside for 20 minutes. When ready to bake, remove pot from the oven. Place your hand underneath the parchment paper and invert the dough into the pot. The seam will be facing up. Cover the pot with the lid. Place your bread into the oven, and reduce the temperature from 500 to 400 F. Bake for 40 minutes, covered. Remove the lid and bake for an additional 15 to 20 minutes, until golden brown. To make sure that the bread is completely cooked through, take its temperature. Carefully tip the bread onto its side and insert a thermometer into the bottom. It should read 200-205 F. If not, place it back into the oven until it is ready (extra time in bread baking is a good thing). If you’re worried about the top getting too brown, put the lid back on. When your bread is ready, transfer to a wire rack to cool. It should feel light and make a hollow sound when you give it a knock underneath. Let it cool for at least 1 hour. Cutting it too soon might ruin the texture resulting in a gummy crumb! If your dough isn’t puffed and bubbly after the initial rise, place it in the microwave with the light on (keeping the door ajar). The warmth from the light will give the yeast a boost. My friend Celia gave me this tip and it works like a charm, especially in chilly kitchens! Thanks! I was concerned that it was a bit too long, but I felt like I had to include every detail! Ooo, leather welding gloves? Sounds serious ;) I actually got my battle wound from grabbing the pot without gloves! It was one of those things- the kids were running around, it was noisy and I just grabbed the 500 F pot without thinking! It was painful, but it’s getting better now. I’m going to go check out your link. Welding gloves are great in the kitchen and out with the barbecue or grill. Make sure they are dry! Wet gloves equals rapid heat transfer and possible steam burns! Look wonderful but do you leave it on the parchment paper to bake? Oh my lord, I almost tried to spread some butter on my computer screen! 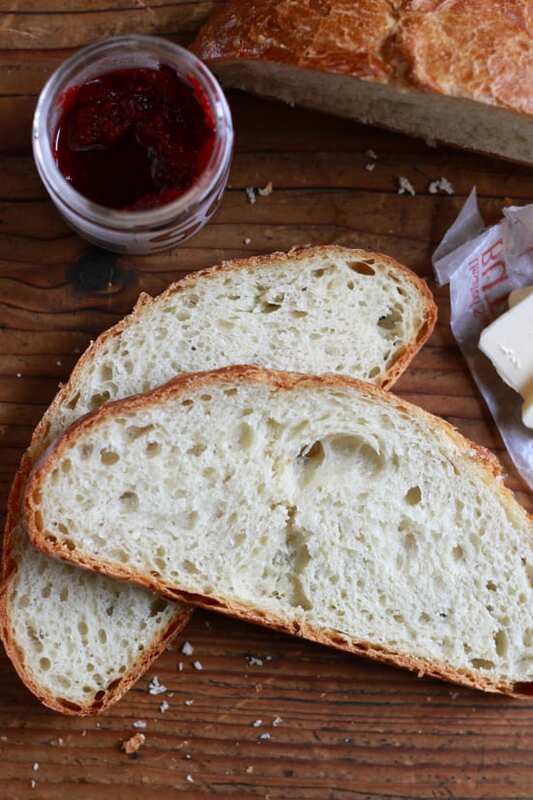 Emilie, your bread turned out so beautifully… just look at that loaf! A crusty gorgeous exterior and soft, tender interior. To be honest, I have never had the patience to make my own bread so this recipe is perfect for me. Your step-by-step instructions (and photos) are so helpful. I wonder if I could add a couple tablespoons of dried or fresh herbs to the mix, how that might go? I think the whole family would just love this recipe! Thank you. As far as adding herbs to the recipe- I’d say go for it! I’ve never done it myself (dried or fresh) but it can’t hurt. Maybe add just a touch your first time around and see how that goes? I’m also working on a whole wheat version as well. I hope you enjoy the recipe! If you have any questions, I’m more than happy to help. I can’t wait to try your method here. 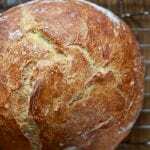 I have been addicted to artisan bread since I discovered the Artisan Bread in 5 Minutes a Day recipe. The recipe is very similar to yours but I love cooking it in a Dutch oven. 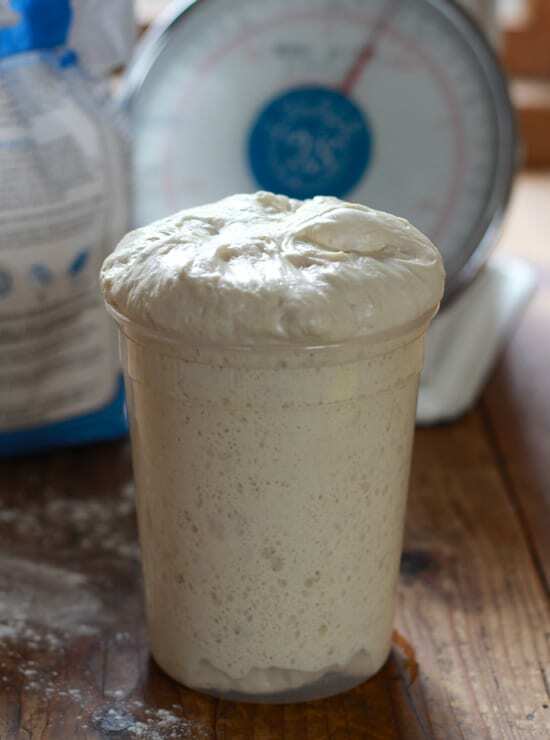 You will need to create or purchase a sourdough starter. This is the medium that develops wild yeast and bacteria, which can be used in lieu of commercial yeast. Wow, your bread looks fabulous. I never bother to knead my dough any more as it works so well without, but have never cooked it in a dutch oven. If I use my cast iron pan, do I need to grease it first or can I just plop the dough in? I love cooking bread in the dutch oven! The lid traps the steam inside, and then once it’s removed the bread becomes a deep, golden brown. It’s amazing. About your cast iron pot- The original recipe did not call for greasing the pot. I believe they recommended adding cornmeal to prevent sticking, but I didn’t do that (I’m not a fan of cornmeal texture on my bread). I read other versions of this recipe where they didn’t use anything at all, which is what I did. I just preheated my pot (un greased) for 20 minutes @ 500F. Then I added the dough, reduced the temp. to 400F, and let it bake away. I’ve never has a problem with sticking. If you’re a little unsure, you could always give your pan a little grease, or utilize the cornmeal method. Just make sure your pan is preheated. This might be good for the first time to test it out? I am very excited. Just pulled the finished product out of the over and it looks exactly like the picture. Now I have to wait impatiently for an hour until it’s cool enough to eat. Aaah! That may be the longest hour ever. I am very excited though. My daughter looked at me and said in her very blasé 19 year old way: You’re excited because you baked bread?” to which I replied “YES!”. I am sure it will be delicious! Thanks so much. I can’t wait to bake my next bread! p.s. So we couldn’t wait the full hour…family got cranky just watching the gorgeous bread…and they lovesd it…so here I am, a week later, about to bake my next loaf. I am also going to bake the individual Irish soda breads this afternoon (don’t you just love baking and cooking?! )…I’ll let you know how they turn out, of course, but I have no doubt they will be smashing! Since I have had such success with your recipe, any suggestions for making an easy and delicious, gorgeous challah? I have looked at lots of recipes but none of them have absolutely intrigued or inspired me. Hi Sara! You know, I’ve never made challah before. But now that you’ve put the idea in my head, I will be on the look out for a good recipe. I will keep you posted! PS- Great idea about covering your pot with foil instead of a lid. I’m glad it worked out! Thanks for your encouragement of my bread. Yours looks absolutely amazing! What size pot do you use? I have one but wonder if it might be too big (26cm). Thanks. I use a deep soup pot and cover it tightly with foil since it doesn’t have a lid…and still absolute perfection! Gorgeous bread, can’t wait to try this out! This is great! My husband loves bread and as soon as he saw the picture he wanted some! I can’twait to get all of my ingredients and start making this recipe! This bread is GORGEOUS! It looks super tasty, I can’t wait to try it out! WOW!!! This bread is delicious! I added Herbs de Provence but that was the only change I made. It is perfect, and tastes just as good (maybe better) as the $7 artisan loaf sold up the street. Thank you for the very clear instructions! This is my new favourite bread! What a great idea!!! I LOVE Herbs de Provence but never thought of putting it in the bread. I love to sprinkle it on my steaks before grilling. Having it in the bread would be a GREAT accompaniment! Thanks! Thank you for such a great recipe and tutorial! I made the bread and fell in love! It is now my “occassion” recipe. Making 2 loaves tonight, 1 for new neighbors & 1 for a “Thank You”!!! Just wondering if anyone has tried to make a Roasted Garlic Loaf with this recipe. I have been contemplating mixing in a handful of garlic cloves when doing the folding step. Not sure if I should do anything to the garlic before incorporating into the dough. Any suggestions? You are so welcome Linnyrae! I am SO pleased that you had success with the recipe. Isn’t baking in a Dutch oven amazing? Who knew?! Do you have an oven thermometer? I ask because the temperature in old ovens can be off sometimes, even though you might think it’s heated to the correct temp. So if you have one, definitely use it! That will help. my husband LOVES all kinds of bread. I am excited to give this a try! The bread tastes great and easy to make. The only problem is that I end up with larger bubbles at the top. I noticed in the photo above that the bubbles are more evenly distributed. Any suggestions? The 2nd photo from the top. There could be several reasons for experiencing an ‘uneven’ crumb. 1.) Dough was too cold- whenever I bake with dough straight out of the fridge, the crumb towards the bottom crust is always finer or more dense. The loaf of bread itself is also heavier. So now, whenever I fridge proof I like to do the second rise at room temperature for at least an hour, (sometimes 2) depending on how cold the kitchen is and how puffy the dough looks. As a result, the crumb and overall loaf is pretty even in texture, fluffy and light. 2.) Are you using the Dutch oven to bake? Sometimes if you take the lid off too soon, the outside crust will harden before the bread has had a chance to fully rise. This will result in an open or big crumb towards the top crust. When then bread can no longer expand, the crumb towards the bottom crust becomes more dense. Does that make sense? Maybe keep the lid on longer to trap in more moisture which is essential to good oven spring and bread expansion. I have a very similar recipe and find using a light beer for about 1/3 of the total liquid works very well. This bread is fantastic! Glorious! I am from Germany and that is the best bread I had (homemade or purchased) since coming to the US in 1997! It reminds me a lot of loafs of bread I had in France. Now if I could only find a great recipe for rye bread and I’d be in bread heaven!!! I have been making this no knead recipe for a little while and I form the loaf on the parchment paper and when it’s time to bake the loaf, I just cut the parchment a couple of inches larger than the loaf and plop the whole thing down in the dutch oven. I’ve made this twice and while it tastes amazing – my loaves aren’t coming out as tall as yours. I follow along with each step and the dough looks like it’s tracking right along with the recipe. Any ideas why my loaves could be coming out a little flatter? Thanks for any help! There are a couple of reasons why your bread could be coming out flatter than the pictured loaves. My guess is that it wasn’t shaped tightly enough before going into the pot (causes spreading), or the oven wasn’t hot enough to allow an adequate oven spring (rise). As a solution, make sure that when you’re shaping the dough into a ball, that you create a good seam underneath to keep it together. It needs to be tight. This definitely takes a little practice, as I struggled with this when I first started baking. In addition to shaping, instead of letting the dough rise on a sheet pan, place it in a cloth-lined, floured bowl (small) or brotform if you have. This will hold its shape so that it doesn’t spread out. Then, invert the dough into your Dutch oven right before baking. And finally, double check the temperature of your oven with a thermometer for accuracy. The hotter it is, the better the oven spring! This bread is the best! I was a little hesitant over the long baking time and high temperature, but I have made it three times already, and it always comes out gorgeous. Really amazing and tasty. I always thought it would be impossible to make an artisan bread without a wood fired oven. I am a potter, and now I feel inspired to create some bake ware just for this bread. I can’t wait to try your other recipes! I once tried to make this, and ended up driving Jim mad by email with my constant whingeing about my inability to produce dough ‘dry’ enough to even fold over ! Don’t cut it before an hour of cooling! Fantastic! Persistence pays off, doesn’t it? Glad you found something suitable for you. I’m sure your loaves are beautiful. Hi, do you think you could make his with spelt flour? Also, do you think a stainless steel caserole pot with lid would work as a Dutch oven substitute? Thank you! Sure. It depends on how much spelt flour you want to use- 100% will yield a more heavy and dense bread, compared to my artisan loaf. I would replace a small amount with spelt flour first and take it form there. Experiment until you find what you like. It’s a matter of personal taste. You’ll have to increase the water as well as whole grain flours absorb more than regular & bread flour. Hi Emilie, we love the crust and taste of this bread, however, we end up with a doughy interior, not at all what yours looks like. We do live in a very humid area. 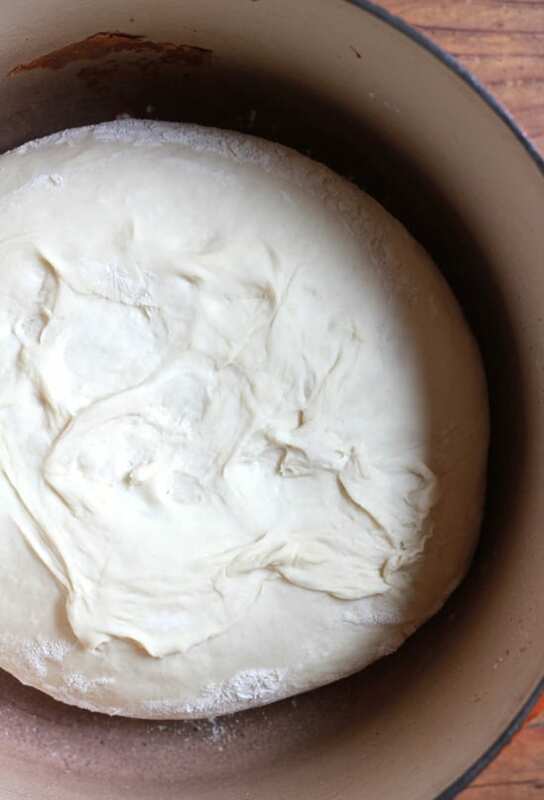 Our dough seems to spread before rising, so we have somewhat of a disk at the end of rising. Could we use less water and more yeast to get a firmer dough that won’t spread? Any suggestions? We’ve made 5 of them up to now and are itching to get it right. 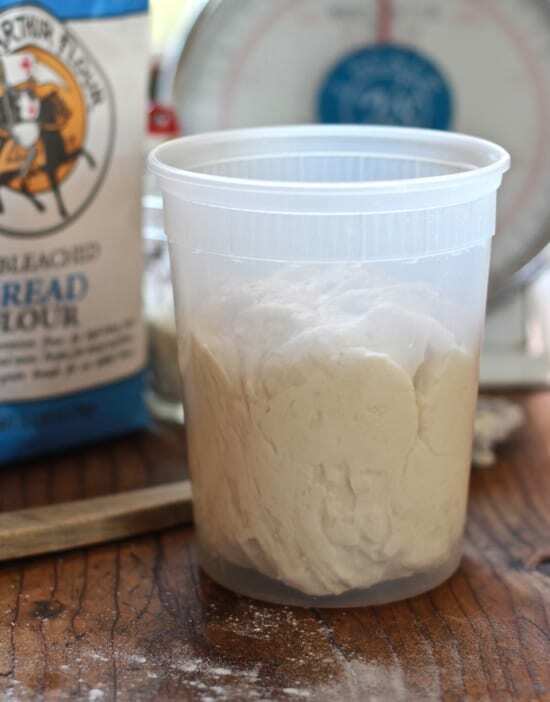 Spreading is normal when bread dough rises, especially when the water content or hydration % is particularly high (like this recipe). 1.) 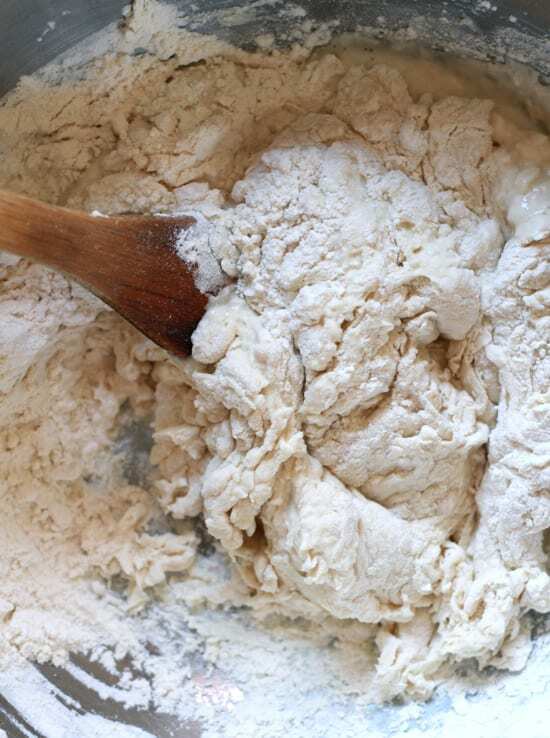 Add more flour to the dough- this will help to firm it up, and it will be easier to handle, however the interior won’t have as many open holes. 2.) Allow your dough to rise in a cloth lined basket or banneton, both dusted in flour. This will contain the dough’s shape as it rises so it won’t spread out to the sides. Also, if the crust is brown on the outside and the inside is doughy, your bread is undercooked. Try lowering the baking temp by 25 degrees, and/or keep the lid on a little longer. You will need to cook out all of the water for the dough to become light and fully cooked through. Extended baking time with the lid on will help. Emilie, thanks SO much for your prompt reply. Attempt #6 today failed, but we’ll try another one shortly using your suggestions and will let you know. No worries, I know the feeling ;) Please let me know if you have any other questions! Good luck! Emilie, attempt #7, much closer, but still a little doughy. I adjusted covered time and cooking time, and lowered the temp, as you suggested. I really think part of it is our high humidity. Attempt 8 coming up shortly. Will see if there’s a way I can post a picture. Hi Emilie. Very nice article. Do you add yeast and salt at same time? And do you use air circulation on the oven? Hi there! Yes, add them both at the same time :) You can use convection if you’d like, but it’s not necessary. 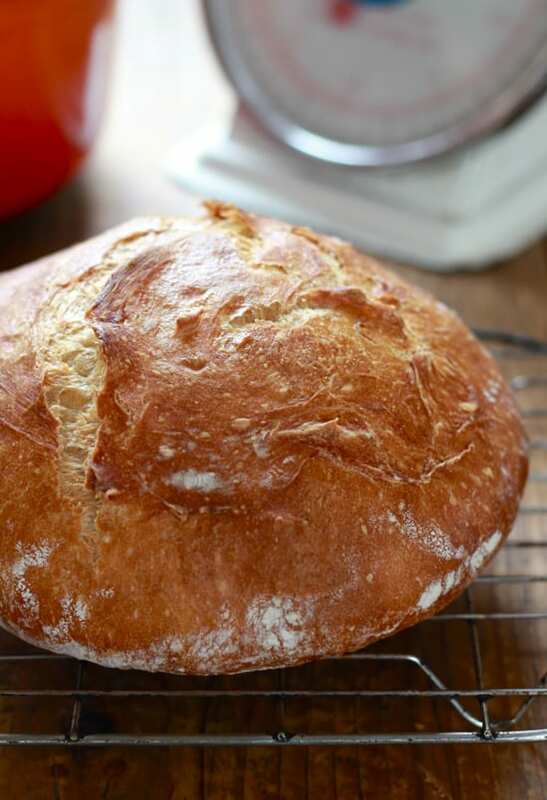 This was so easy…I have rheumatoid arthritis and can no longer knead traditional recipes…I haven’t been able to make good bread for several years (I know they are convenient but I don’t like bread machine bread). Rhis was perfect. The only issue I had was my loaf shape disintegrated when I was putting it in the Dutch oven…I just put the lid on, popped it in the oven, and crossed my fingers! It came out perfect! Can’t thank you enough…I shared the heck out of your page all over my social media! Hi Emilie, I made the bread today and I noticed that the initial step of combining 3 cups of flour and 1.5 cups water produced a very dry and crumby dough. It seemed that there was too much flour for the water to wet. I did manage to knead it all together because stirring it didn’t bring it together. I let it rise for 18 hours, and then 3 hours after, but when I flipped it into the hot pan I noticed that it did not rise but stayed pretty flat after I flipped it into the pan. It still looks and tastes great, but I am wondering if my dough was too dry and if I let it rise for too long in the second rise? I am going to try it again and see if i can make something that looks closer to your photo. Thanks. I love your website, especially the gorgeous pictures! For this particular dough, it’s best to begin stirring with a spoon and then switch to mixing with your hands (which I think you did). This will hep to ensure that the flour absorbs all of the water. It is stiff in the beginning, but after your keep wiring it, it will come together nicely. With regards to rising, the initial 18 hours wass fine, but the additional 3 hours was too long. This is the reason why your bread came out flat (not because the dough was dry). Next time, shorten that second rise to about 1 hour or so and you should see a difference. My mom is 85 and she’s been baking her own bread since she was a child. Naturally, I’ve been using her method but it’s the traditional way, with lots of kneading etc. and it’s not easy to find the time… When I saw your recipe yesterday, I jumped on it. I was preparing a lunch for friends today and thought it would be lovely to be able to offer fresh-baked bread. I followed your recipe and tutorial with the following exceptions: I didn’t have time to go to the store for bread flour so I used all-purpose (I figured if it’s a bust, I had a back-up store-bought baguette I could serve) and instead of a round Dutch oven, I used my oval 4.5L Le Creuset. It’s clear to me the bread flour would raise this loaf to the next level however, it came out quite good. Lots of little air pockets and gorgeous crust, everyone loved it. I noticed some folks who posted here had trouble with the dough sticking to the parchment paper, even when well-floured. My trick, (my mom’s trick actually), is to rub my hands with a small amount of olive oil before I handle the dough. I ease it from the paper with little disruption and also don’t get any of it stuck on my hands which can cause the dough to deflate and collapse. If you like, I can send you a photo of the final product. Thank you for a great recipe, I am back to making home-made bread now, thanks to you. Oh, this is such a wonderful story. Thank you for sharing this with me. The no-knead method is absolutely fantastic and sure saves a lot of elbow grease! I use this same method for my sourdough as well… and thank you for the tips about sticking! This is why bread baking is so great- there are so many different tips & tricks to share. Just lovely. H.E.L.P. – I would like nothing more than to master this recipe. Have tried it twice and twice I got the same results. Followed the recipe exactly, specifically,…to the “T”. Still the results were no where as illustrated. First try resulted in a thick, hard crust (nearly cracked a tooth! ), with a thick, heavy and dense inner bread. No nooks and crannies. Second attempt was pretty much the same but since I pulled it out before browning too much, the crust wasn’t as hard. Still, dense inner bread. I know from past baking experience, I am NO baker but this is one I thought I’d have no problem since it sounds SO easy. I would appreciate any help since this is one baking hurdle I really want to accomplish because my troop at home inhales ANY artisan bread within 50 feet of them. Thanks so much. I made this last night/today and I finally just took a bite…IT IS SOOO GOOD!!! My bread usually comes out way too lofty and it can’t even stand up to soft butter. This bread, however, is sturdy and has tons of flavor. It looks like something I could buy from Sainsbury’s. I am so proud of myself! Haha thank you for posting this recipe, it’s changed my bread game forever. I’m going to make another loaf tonight/tomorrow! (cause I’m pretty sure my husband and I will eat this whole thing tonight haha). Cheers! Hi there! I’ve been making this bread for a few months now and I still love it! I’ve been experimenting with whole wheat flour and have found that half white and half wheat makes a delicious loaf! I also double this recipe without any problems. I live in Chile and haven’t found real bread flour so I’ve always just gone with all-purpose and its always good! Thanks again for the tutorial! Cheers! Found this recipe last night and followed it to the letter. Made the most perfect loaf of bread on my first try! Great tutorial. Wish I could post a picture of it. Never using another recipe for bread again. I’m having problems with the second rise. 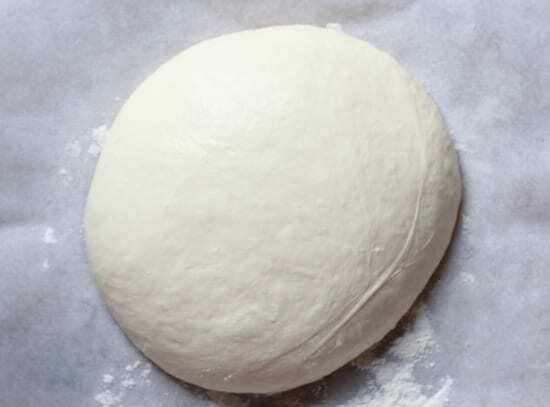 My yeast and flour are fresh, I get a wonderful first rise after 12 – 18 hours, but when I take it out of the container and fold and shape it it becomes flat and runny, and does not rise again at all. What is the problem? The second rise is always the most challenging to judge. And there could be a number of reasons for a flat and runny dough. I would shorten the bulk rise (first rise) to 12 hours. 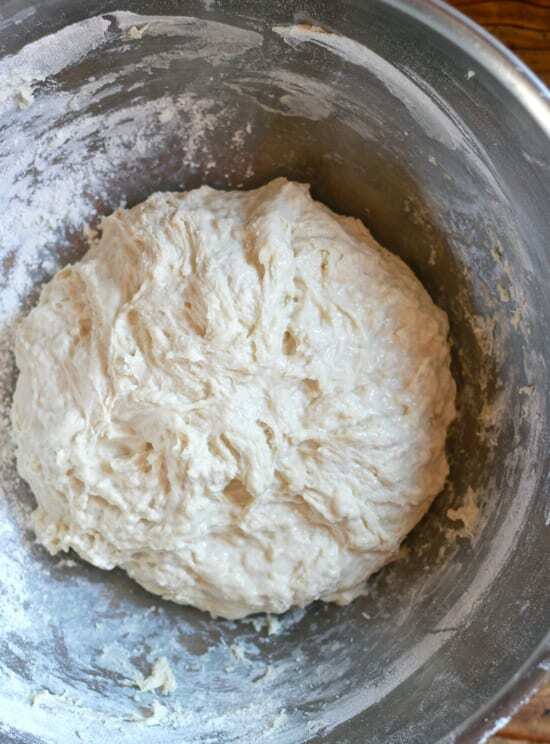 When doing the second rise, place the dough in a cloth lined bowl (8 inches is good) to prevent it from spreading. Let is rest for 30 minutes. Then, continue with the rest of the instructions and see if that helps. Good luck! My question is about preheating the dutch oven — as most manufacturers do not recommend heating a dry pan. I am concerned about cracking the interior. You have not had any problems with this? I’ve never had a problem with this, but I’m only speaking from my experience. If you don’t feel comfortable preheating your pot, you don’t have to. Put the dough in cold and bake it following the recipe instructions. Eager to make this bread but I only have a 4 quart Dutch oven. What do you think would happen if I halved the recipe? I’m afraid if I made the full recipe, it would be too much volume for the Dutch oven. Hello, Is it necessary to complete the 1st rise in a separate bowl or can i let it rise in the mixing bowl? You can certainly do the 1st rise in the mixing bowl. No problem! This is a lovely recipe, but I do find the dough way too sticky. I added quite a bit more flour. I also added quite a bit more yeast as I did not think it was enough for the quantity of flour. I’m no expert baker but I have made bread on the odd occassion and usually use more yeast. The cast iron worked beautifully and no oil required. I loved the result. I added olives to mine as my family all love olive bread. Wonderful results. Thanks so much for the recipe. This is a fabulous recipe. I make it ALL the time and it’s delicious! I used the recipe originally because I had some left over bread flour –I had always used a.p. for no-knead bread before trying this. I tend to let mine rise for about 24 hrs instead of 14 and it works and tastes great. The only problem I had with no-knead breads were the way they tend to flatten in the dutch oven making the slices from the loaf longer and skinnier than I prefer. I tried using a bit less water (dough seems to hold it shape better for me) and cooking it in a 3.2-quart dutch oven. Cooks in the same time as the recipe and produces a rounder loaf. I thank you so much for this great recipe! Hi. The first time I made this loaf it was perfect but since then I’ve had a couple of problems.. the dough rises massively within 10 hours – should I leave it for another 4? Also the dough was so sticky that I couldn’t fold or shape it and it stuck to everything! Is this because I’m not leaving it to rise for the full 14 hours or should I be adding more flour/less water?